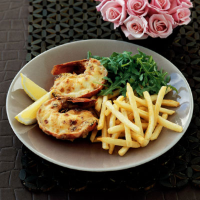 Our easy version of classic lobster thermidor uses meaty rock lobster tails smothered in a rich cheese and mustard sauce. Perfect for Valentine's Day. Cut each of the lobster tails in half lengthways by inserting a sharp knife in the centre of the tail and cutting right through the flesh and the shell to one end. Turn the whole tail around, keeping the cut side uppermost. Repeat the process to end up with the whole tail cut into 2 equal pieces. Place in a heatproof serving dish, cut-side up. Melt the butter in a medium saucepan. Add the flour and, using a wooden spoon, mix together to a thick paste (roux). Cook over a medium heat for 3-4 minutes, stirring constantly. Gradually add the warmed milk, stirring between each addition, until the sauce is thick and creamy. Reduce the heat to low and stir in 3/4 of the Parmigiano Reggiano and all the mustard. Season. Preheat the grill to high. Cook the lobster tails in the dish under the hot grill for 5 minutes. Spoon the cheese sauce equally between the lobster halves and sprinkle over the remaining Parmigiano Reggiano. Grill for 4-5 minutes or until bubbling, golden and the lobster is cooked through (cover the tips of the tails with some foil if they brown too much). Serve the lobster with the wild roquette, lemon wedges and Waitrose American Coated Oven Chips (from the freezer cabinet). Prepare the lobster to the end of Step 1 and keep covered in the fridge, for up to 12 hours. If time is short, use Waitrose Fresh Cheese Sauce rather than making your own.